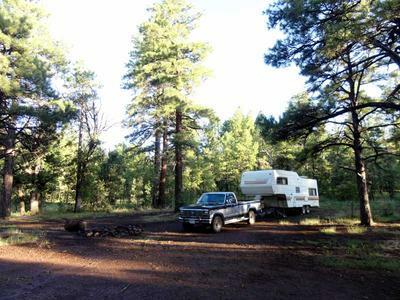 Mormon Lake is a heavenly RV camping destination in northern Arizona. 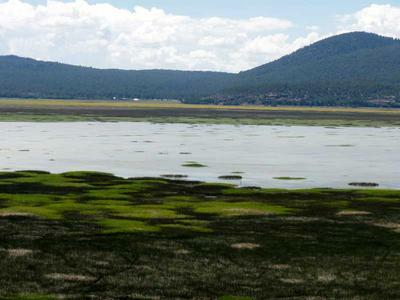 Located near Flagstaff in the Coconino National Forest at 7,100 feet, it's the largest natural lake in Arizona when full (lake levels fluctuate from year to year). 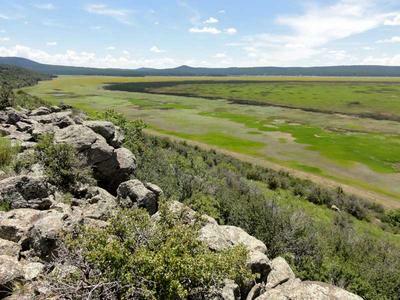 This area on Anderson Mesa has tall ponderosa pine forest, meadows, and several lakes. It's hard to leave a campsite as beautiful as this. It would make quite a nice little homestead, and did indeed during my 2 week stay. Campsite Directions: From Flagstaff head southeast on Lake Mary Road (Highway 3) for 20 miles. Turn right (west) on Mormon Lake Road (Hwy 90) and drive 1.8 miles. Turn right (northwest) on Forest Road 132 (West Weimer Springs Road) and drive 0.4 miles. Turn left and follow this short road to the camping area. There's plenty of room here, even for big RVs. More Campsites: There are several more great campsites just a short ways northwest up FR 132. Hiking: Except for Mormon Mountain to the southwest, it’s mostly flat here and hiking cross-country is very easy. There are several primitive forest roads that make hiking even easier. There are many lakes here on Anderson Mesa, and they make excellent hiking destinations. Mormon Lake and Mormon Mountain each have a trail. Mormon Mountain Trail takes you to the top of the mountain and is a nice forest hike, but there aren’t many views from the top, except of the forest. 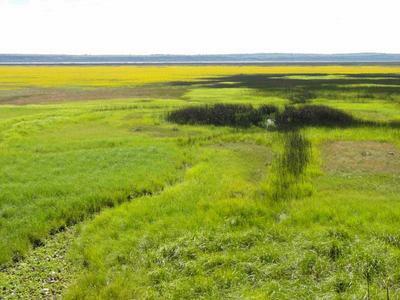 For scenic views, take Lakeview Trail, which ends at a fantastic overlook of Mormon Lake and the surrounding forest. And last but not least, the Arizona Trail is only 1/10 mile south of this campsite. I hiked and even mountain biked on a portion of it. This National Scenic Trail spans the entire state, from the Mexican border to Utah. Weather: Highs have been in the mid 70s to mid 80s. Lows have been in the mid 50s. It’s been typical monsoon season weather: sunny skies in the early morning, clouds begin increasing by late morning, sometimes filling the sky by noon, then the thunder and lightning show begins. Most days, these are isolated thunderstorms, so you don’t get a direct hit every day. Most days you'll see only a short afternoon shower, or a few sprinkles, and hear thunder in the distance. Every few days it will really pour with lightning striking very close by. A couple days ago it was a bit different: it began to rain around noon and continued all afternoon. Most of the time the storm will soon pass by and the rain will cease. Then by late afternoon the clouds will dissipate and the sun will shine once again. Around 5 or 6 pm the weather will be calm and pleasant – perfect for a short stroll. Thankfully the roads are drivable soon after a rain and 4WD is not needed. I never had any very strong winds here. Early mornings and evenings are usually windless – perfect RC model flying weather. During the day there’s usually a slight breeze. Wildlife: There’s lots of elk here. I saw a few coyotes while hiking. I also saw ducks, heron, turkey vultures, eagles, woodpeckers, hummingbirds, many more birds, groundhogs at Lower Lake Mary, many squirrels, rabbits, lizards, and I heard owls. Insects: There are lots of wildflowers in the meadows and at the lakes. This equates to lots of bees! I’ve had no issues though. I’ve seen a few mosquitoes in the evenings. There are many flies here, which don’t bite – but are sometimes annoying. Cows: There are many cows here in the forest, though they aren’t visible most of the time. Cell Signal: Unfortunately my Verizon cell phone signal wasn't great and would cut out often. Verizon mobile broadband internet was slow and all I could get was National Access service here. I have a feeling it's because I'm so close to Mormon Mountain. RV Solar: This campsite was a bit too shaded for my solar panel – however, if it had been mostly sunny I probably would have been ok getting my batteries charged. Unfortunately with the cloudy weather of monsoon season, I didn't get a full charge everyday. RV Campsite Rating: 9 out of 10. Sure, it's a bit too shaded for RV solar panels, and you'll be sharing the campsite with cows - but otherwise it's a green and blue paradise filled with forests, meadows, lakes, and the trails that take you there. This high country landscape is heavenly!